PENDLETON, Ore. – When his good friend Cody Greer was hooked to the ground, Evan Allard jumped in to help. 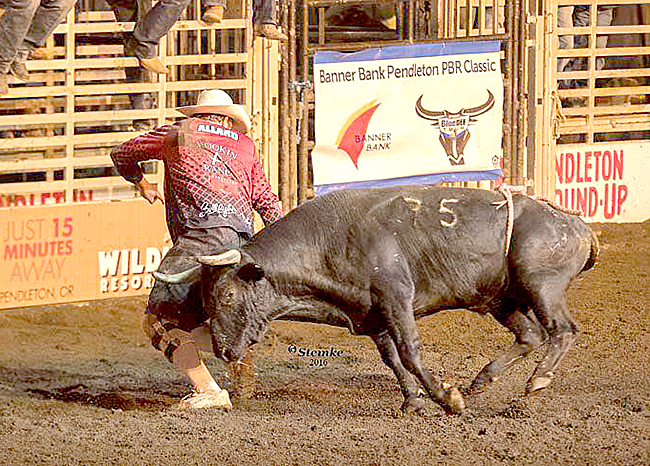 That’s what bullfighters do when one of their own is in trouble, but it took a toll on Allard, who had yet to compete during the Bullfighters Only tour stop in conjunction with the Pendleton Roundup, which took place Monday and Tuesday in Happy Canyon. It worked out pretty well for the Oklahoma man, who posted an 86-point fight Tuesday night to win the Pendleton title. He edged out Dusty Tuckness of Meeteetse, Wyo., and Weston Rutkowski of Haskell, Texas, both of whom posted 85.5-point bouts on Monday – Tuckness earned second place by the tie-breaker, which referred back to the highest bullfighter score. That was the case with Little Foot. Allard threw a couple of strong fakes, and the bull drove past. Then the bullfighter made a round with Little Foot before the animal made his way to the barrel, plowing it end over end. He worked the barrel well, then pulled Little Foot away for a couple more fakes, then returned to the barrel. He worked it masterfully to close out the fight and claim the crown. “It was pretty important to get that win,” said Allard, who has been among the top 10 in the Bullfighters Only standings much of the season. “I needed a win. I’ve had a pretty rough last month or so. I’ve been hooked a bunch, in the arena and in the back pens. I took a nasty hooking at Caldwell and another one in Arlington, Minn., so I needed this. Of course, winning an event that is tied to such a historic rodeo as the Pendleton Roundup is another feather in the bullfighter’s cap.